An iceberg is a large piece of freshwater ice that has broken off a glacier or an ice shelf and is floating freely in open (salt) water. Another name for iceberg is "ice mountain". Small bits of disintegrating icebergs are called "growlers" or "bergy bits". Fresh water is any naturally occurring water except seawater and brackish water. Fresh water includes water in ice sheets, ice caps, glaciers, icebergs, bogs, ponds, lakes, rivers, streams, and even underground water called groundwater. Fresh water is generally characterized by having low concentrations of dissolved salts and other total dissolved solids. Though the term specifically excludes seawater and brackish water, it does include mineral-rich waters such as chalybeate springs. A glacier is a persistent body of dense ice that is constantly moving under its own weight; it forms where the accumulation of snow exceeds its ablation over many years, often centuries. Glaciers slowly deform and flow due to stresses induced by their weight, creating crevasses, seracs, and other distinguishing features. They also abrade rock and debris from their substrate to create landforms such as cirques and moraines. Glaciers form only on land and are distinct from the much thinner sea ice and lake ice that form on the surface of bodies of water. Solid is one of the four fundamental states of matter. In solids particles are closely packed. It is characterized by structural rigidity and resistance to changes of shape or volume. Unlike liquid, a solid object does not flow to take on the shape of its container, nor does it expand to fill the entire volume available to it like a gas does. The atoms in a solid are tightly bound to each other, either in a regular geometric lattice or irregularly. Solids cannot be compressed with little pressure whereas gases can be compressed with little pressure because in gases molecules are loosely packed. A liquid is a nearly incompressible fluid that conforms to the shape of its container but retains a (nearly) constant volume independent of pressure. As such, it is one of the four fundamental states of matter, and is the only state with a definite volume but no fixed shape. A liquid is made up of tiny vibrating particles of matter, such as atoms, held together by intermolecular bonds. 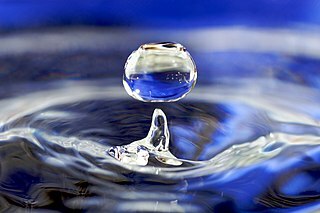 Water is, by far, the most common liquid on Earth. Like a gas, a liquid is able to flow and take the shape of a container. Most liquids resist compression, although others can be compressed. Unlike a gas, a liquid does not disperse to fill every space of a container, and maintains a fairly constant density. A distinctive property of the liquid state is surface tension, leading to wetting phenomena. Methane ( or ) is a chemical compound with the chemical formula CH4 (one atom of carbon and four atoms of hydrogen). It is a group-14 hydride and the simplest alkane, and is the main constituent of natural gas. The relative abundance of methane on Earth makes it an attractive fuel, although capturing and storing it poses challenges due to its gaseous state under normal conditions for temperature and pressure. The International Ice Patrol is an organization with the purpose of monitoring the presence of icebergs in the Atlantic and Arctic Oceans and reporting their movements for safety purposes. It is operated by United States Coast Guard but is funded by the 13 nations interested in trans-Atlantic navigation. As of 2011 the governments contributing to the International Ice Patrol include Belgium, Canada, Denmark, Finland, France, Germany, Greece, Italy, Japan, the Netherlands, Norway, Panama, Poland, Spain, Sweden, the United Kingdom, and the United States. The Ross Ice Shelf is the largest ice shelf of Antarctica. It is several hundred metres thick. The nearly vertical ice front to the open sea is more than 600 kilometres (370 mi) long, and between 15 and 50 metres high above the water surface. Ninety percent of the floating ice, however, is below the water surface. The word iceberg is a partial loan translation from the Dutch word ijsberg, literally meaning ice mountain,  cognate to Danish isbjerg, German Eisberg, Low Saxon Iesbarg and Swedish isberg. This type of iceberg, also known as an ice island,  can be quite large, as in the case of Pobeda Ice Island. Antarctic icebergs formed by breaking off from an ice shelf, such as the Ross Ice Shelf or Filchner-Ronne Ice Shelf, are typically tabular. The largest icebergs in the world are formed this way. Before the early 1910s, although there had been many fatal sinkings of ships by icebergs, there was no system in place to track icebergs to guard ships against collisions. In 1907, SS Kronprinz Wilhelm , a German liner, had rammed an iceberg and suffered a crushed bow, but was still able to complete her voyage. The advent of steel ship construction led designers to declare their ships "unsinkable". 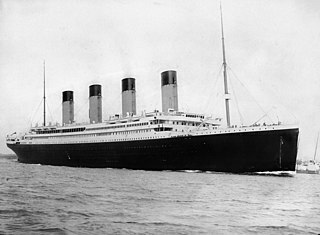 The April 1912 sinking of the Titanic , which killed 1,518 of its 2,223 passengers and crew, changed all that. For the remainder of the ice season of that year, the United States Navy patrolled the waters and monitored ice flow. In November 1913, the International Conference on the Safety of Life at Sea met in London to devise a more permanent system of observing icebergs. Within three months the participating maritime nations had formed the International Ice Patrol (IIP). The goal of the IIP was to collect data on meteorology and oceanography to measure currents, ice-flow, ocean temperature, and salinity levels. They monitored iceberg dangers near the Grand Banks of Newfoundland and provided the "limits of all known ice" in that vicinity to the maritime community. The IIP published their first records in 1921, which allowed for a year-by-year comparison of iceberg movement. An ice shelf is a thick suspended platform of ice that forms where a glacier or ice sheet flows down to a coastline and onto the ocean surface. Ice shelves are only found in Antarctica, Greenland, Canada, and the Russian Arctic. The boundary between the floating ice shelf and the anchor ice that feeds it is called the grounding line. The thickness of ice shelves can range from about 100 m (330 ft) to 1,000 m (3,300 ft). The Filchner-Ronne Ice Shelf, also known as Ronne-Filchner Ice Shelf, is an Antarctic ice shelf bordering the Weddell Sea. The Larsen Ice Shelf is a long ice shelf in the northwest part of the Weddell Sea, extending along the east coast of the Antarctic Peninsula from Cape Longing to Smith Peninsula. It is named for Captain Carl Anton Larsen, the master of the Norwegian whaling vessel Jason, who sailed along the ice front as far as 68°10' South during December 1893. In finer detail, the Larsen Ice Shelf is a series of shelves that occupy distinct embayments along the coast. From north to south, the segments are called Larsen A, Larsen B, and Larsen C by researchers who work in the area. Further south, Larsen D and the much smaller Larsen E, F and G are also named. McMurdo Sound and its ice-clogged waters extends about 55 kilometres (34 mi) long and wide. The sound connects the Ross Sea to the north with the Ross Ice Shelf cavity to the south via Haskell Strait. The strait is largely covered by the McMurdo Ice Shelf. The Royal Society Range rises from sea level to 4,205 metres (13,796 ft) on the western shoreline. Ross Island, an historic jumping-off point for polar explorers, designates the eastern boundary. The active volcano Mount Erebus at 3,794 metres (12,448 ft) dominates Ross Island. Antarctica's largest scientific base, the United States' McMurdo Station, as well as the New Zealand Scott Base are on the southern shore of the island. Less than 10 percent of McMurdo Sound's shoreline is free of ice. It is the southernmost navigable body of water in the world. The Bay of Whales was a natural ice harbor, or iceport, indenting the front of Ross Ice Shelf just north of Roosevelt Island, Antarctica. It is the southernmost point of open ocean not only of the Ross Sea, but worldwide. The Ross Sea extends much further south—as far as the Gould Coast, some 200 miles (320 km) from the South Pole—but most of that area is covered by the Ross Ice Shelf rather than open sea. Iceberg B-15 was the world's largest recorded iceberg. It measured around 295 kilometres (183 mi) long and 37 kilometres (23 mi) wide, with a surface area of 11,000 square kilometres (4,200 sq mi)—larger than the whole island of Jamaica. Calved from the Ross Ice Shelf of Antarctica in March 2000, Iceberg B-15 broke up into smaller icebergs, the largest of which was named Iceberg B-15A. In 2003, B-15A drifted away from Ross Island into the Ross Sea and headed north, eventually breaking up into several smaller icebergs in October 2005. The Drygalski Ice Tongue or Drygalski Barrier or Drygalski Glacier Tongue is a glacier in Antarctica, on the Scott Coast, in the northern McMurdo Sound of Antarctica's Ross Dependency, 240 kilometres (150 mi) north of Ross Island. The Drygalski Ice Tongue is stable by the standards of Antarctica's icefloes, and stretches 70 kilometres (43 mi) out to sea from the David Glacier, reaching the sea from a valley in the Prince Albert Mountains of Victoria Land. The Drygalski Ice Tongue ranges from 14 to 24 kilometres wide. Sulzberger Bay is a bay between Fisher Island and Vollmer Island, along the coast of King Edward VII Land. Discovered by the Byrd Antarctic Expedition on December 5, 1929, and named by Byrd for Arthur H. Sulzberger, publisher of The New York Times, a supporter of the Byrd expeditions in 1928–1930 and 1933–1935. Iceberg B-9 was an iceberg that calved in 1987. The iceberg measured 154 kilometres (96 mi) long and 35 kilometres (22 mi) wide with a total area of 5,390 square kilometres (2,080 sq mi). It is one of the longest icebergs ever recorded. The calving took place immediately east of the calving site of Iceberg B-15 and carried away Little America V.
Totten Glacier is a large glacier draining a major portion of the East Antarctic Ice Sheet, through the Budd Coast of Wilkes Land in the Australian Antarctic Territory. The catchment drained by the glacier is estimated at 538,000 km2 (208,000 sq mi), extending approximately 1,100 km (680 mi) into the interior and holds the potential to raise sea level by at least 3.5 m (11 ft). Totten drains northeastward from the continental ice but turns northwestward at the coast where it terminates in a prominent tongue close east of Cape Waldron. It was first delineated from aerial photographs taken by USN Operation Highjump (1946–47), and named by Advisory Committee on Antarctic Names (US-ACAN) for George M. Totten, midshipman on USS Vincennes of the United States Exploring Expedition (1838–42), who assisted Lieutenant Charles Wilkes with correction of the survey data obtained by the expedition. The Erebus Ice Tongue is a mountain outlet glacier and the seaward extension of Erebus Glacier from Ross Island. It projects 11 kilometres (6.8 mi) into McMurdo Sound from the Ross Island coastline near Cape Evans, Antarctica. The glacier tongue varies in thickness from 50 metres (160 ft) at the snout to 300 metres (980 ft) at the point where it is grounded on the shoreline. Explorers from Robert F. Scott's Discovery Expedition (1901–1904) named and charted the ice tongue. Pobeda Ice Island, original Russian name остров Победы, is an ice island in the Mawson Sea. It is located 160 km (99 mi) off the coast of Queen Mary Land, East Antarctica. This island, which exists periodically, is formed by the running aground of a tabular iceberg. Ice calving, also known as glacier calving or iceberg calving, is the breaking of ice chunks from the edge of a glacier. It is a form of ice ablation or ice disruption and is normally caused by the glacier expanding. It is the sudden release and breaking away of a mass of ice from a glacier, iceberg, ice front, ice shelf, or crevasse. The ice that breaks away can be classified as an iceberg, but may also be a growler, bergy bit, or a crevasse wall breakaway. Petermann Glacier is a large glacier located in North-West Greenland to the east of Nares Strait. It connects the Greenland ice sheet to the Arctic Ocean at 81°10' north latitude, near Hans Island. Wilkins Sound is a seaway in Antarctica that is largely occupied by the Wilkins Ice Shelf. 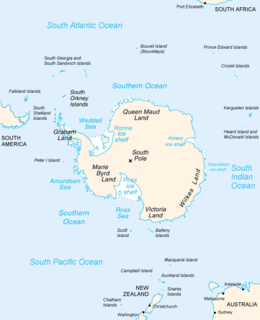 It is located on the southwest side of the Antarctic Peninsula between the concave western coastline of Alexander Island and the shores of Charcot Island and Latady Island farther to the west. Ice mélange refers to a mixture of sea ice types, icebergs, and snow without a clearly defined floe that forms from shearing and fracture at the ice front. Ice mélange is commonly the result of an ice calving event where ice breaks off the edge of a glacier. Ice mélange affects many of the Earth's processes including glacier calving, ocean wave generation and frequency, generation of seismic waves, atmosphere and ocean interactions, and tidewater glacier systems. Ice mélange is possibly the largest granular material on Earth, and is quasi-2-dimensional. Iceberg A-68 calved from the Larsen C Ice Shelf in July 2017. With a surface area of 5,800 square kilometres, twice the size of Luxembourg, larger than Delaware and weighing one trillion tonnes, it is one of the largest recorded icebergs, the largest being B-15 which measured 11,000 square kilometres before breaking up. The calving of A-68 reduced the overall size of the Larsen C shelf by 12 percent. ↑ "Iceberg". Online Etymology Dictionary. Retrieved 2006-03-26. 1 2 "Facts on Icebergs". Canadian Geographic. 2006. Archived from the original on 2006-03-31. ↑ "Antarctica shed a 208-mile-long berg in 1956". Polar Times. 43. 2005-01-20. p. 18. ↑ "Sizes and Shapes of Icebergs" (PDF). International Ice Patrol. Retrieved 2006-12-20. ↑ Holly Gordon (2006). "Iceberg Physiology". Canadian Geographic. Archived from the original on 2006-03-31. ↑ "Envisat". European Space Agency. Retrieved 2011-03-09. ↑ Ainslie MacLellan (2006). "Tracking Monsters". Canadian Geographic. Archived from the original on 2006-10-31. ↑ "New Iceberg Breaks off Ronne Ice Shelf in Antarctica". NOAA. 15 October 1998. Retrieved 2011-03-09. ↑ Martin, Seelye; Drucker, Robert; Aster, Richard; Davey, Fred; Okal, Emile; Scambos, Ted; MacAyeal, Douglas (2010). "Kinematic and seismic analysis of giant tabular iceberg breakup at Cape Adare, Antarctica". Journal of Geophysical Research. 115. doi:10.1029/2009JB006700. ↑ "Alaskan storm cracks giant iceberg to pieces in faraway Antarctica". ↑ MacAyeal, Douglas R; Okal, Emile A; Aster, Richard C; Bassis, Jeremy N; Brunt, Kelly M; Cathles, L. Mac; Drucker, Robert; Fricker, Helen A; Kim, Young-Jin; Martin, Seelye; Okal, Marianne H; Sergienko, Olga V; Sponsler, Mark P; Thom, Jonathan E (2006). "Transoceanic wave propagation links iceberg calving margins of Antarctica with storms in tropics and Northern Hemisphere". Geophysical Research Letters. 33 (17). doi:10.1029/2006GL027235. ↑ "Iceberg A-38B off South Georgia". Visible Earth. Archived from the original on 2008-10-05. Retrieved 2011-03-09. ↑ "Iceberg four times the size of London breaks off from Antarctica ice shelf". The Telegraph . Retrieved 14 July 2017. ↑ Brad Lendon, CNN (22 April 2014). "Iceberg is twice the size of Atlanta - CNN.com". CNN. ↑ "Pine Island Glacier Quickly Drops Another Iceberg". Nasa Earth Observatory. NASA . Retrieved 12 November 2018. ↑ "Huge ice sheet breaks from Greenland glacier". BBC. 2010-08-07. Retrieved 2011-03-09. ↑ "Massive Iceberg Crashes into Island, Splits in Two". Archived from the original on 2011-03-10. ↑ "Massive ice island heading for southern Labrador". CBC News. 2011-06-23. ↑ "Shipping alert issued over giant iceberg". Associated Press. December 11, 2009. 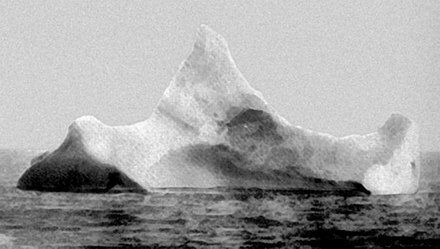 Wikimedia Commons has media related to Iceberg .